fter twenty years of being away, Harlow has come back to his birth pack. Now in his early forties, he’s a doctor and ready to retire from human life in order to take his place in the pack. But the pack he left behind isn’t anything like what he comes back to. His older brother is the new alpha, and the pack that was once full of families is now little more than a harem of young wolves following his brother blindly. The only one not afraid of his brother is his beta, Nathan, who stays to protect the others. Harlow brings with him the much needed hope Nathan has been searching for, but Harlow has to prove himself worthy of the position of alpha before Nathan will follow him. I liked His Brother’s Beta by Caitlin Ricci and A.J. Marcus. 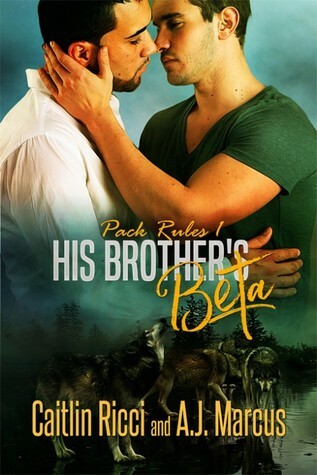 His Brother’s Beta is the first book in the Pack Rules series. I did have mixed feelings about this book. His Brother’s Beta is well written, and I liked the plot but the second half of the book seemed rushed and not as developed as the first half of the book. I would have liked better chemistry between Harlow and Nathan. I liked both Harlow and Nathan as separate characters, but there didn’t seem to be any chemistry between them before they became mates. I would have liked to see more of a build-up of chemistry between them. I also hated Harlow’s brother Silvio and his how he treated his “harem,” but that’s how I was supposed to feel about him so great job there. I think what bothered me the most is how young the men in the “harem” are. Although it’s stated that they’re at least 19 years old, they seem younger because of how they acted, whether in human form or wolf form. I did like what happened to Silvio and how the pack recovered. I did like Lydia’s character and how she stayed to protect the “harem” as much as she could from Silvio. Poor Harlow didn’t know what he was getting himself into when he came back to take his place in the Woodlands pack after finishing his schooling and his stint with the Peace Corps. He came back to be the pack’s doctor. He definitely wasn’t expecting to find that everybody he knew, except for his friend Lydia and younger brother Silvio, who is now the pack’s Alpha, to be gone. Now it’s up to Harlow to find out what happened and come up with a plan to fix everything. The brother Harlow knew is no more and has been replaced by a monster that only cares about what he wants and has a taste for young men, his harem.